Did you know that you can access the Los Angeles Superior Court records for any civil claim including personal injury and wrongful death actions? Did you know, you can look up information including docket sheets for pleadings filed (including complaints, answers, motions and other filings) on any civil case in Los Angeles County. Here is the link to Los Angeles Superior Court Civil Case Information. From this link, put in the case number and the branch of the court in which it was filed. Initial Paperwork: This includes the “Complaint”, “Summons”, and “Civil Case Cover Sheet including Addendum”. These papers are filed with the proper court, stamped “Filed” by the Clerk and the Summons is issued. Service of Process: The above papers must be personally served in almost all cases. This means that a certified “process server” or someone over the age of 18 who is not a party to the lawsuit must physically deliver the documents to the defendant or, in the case of a business, the businesses’s “Agent for Service of Process”. There are other possible ways to serve an individual including “substitute service” (personally delivery to a person over the age of 18 that is living in the same household with mailed copy to follow) and “service by publication (serving by posting in a newspaper or other periodical of specified circulation and only upon court approval after other means have proven unsucessful). 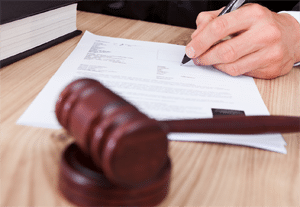 Why is it Important to Hire a Personal Injury Lawyer Before Initiating any Civil Action? As I discuss elsewhere in my website, there are times when a person can file an action in small claims court for minor cases that don’t involve personal injury or where low dollar amounts are at stake. However, for the most part you should at least consult with an experienced personal injury attorney prior to initiating any civil action for money damages in a court of law. Why? Because filing the initial paperwork and getting it served properly is in itself somewhat difficult. More importantly, this is the FIRST STEP in a much more complicated process called “litigation.” After the papers are served, the party is entitled to hire an attorney and, in most instances where there is insurance involved, an attorney will be provided and paid for by their insurance company. At that point, the “discovery process” begins whereby both sides are allowed to send requests for information and documents, and take a “deposition” (formal interview with a court reporter where the testimony has the same weight as if provided in court). If proper procedures are not followed and deadlines not met, a case can be dismissed by the court for failure to comply with the applicable rules of court. Furthermore, while most civil claims for personal injury or wrongful death resolve by way of settlement, this is usually done in a formal setting such as a “mediation” (meeting between the parties and the third party “neutral” person meant to help the sides come together). Finally, if the case cannot resolve, it proceeds to a trial before a judge or jury. There are very strict rules on what must be prepared and when prior to any such legal proceeding and, again, failure to comply with the rules can lead to your case being dismissed, sometimes without the ability to ever file it again.